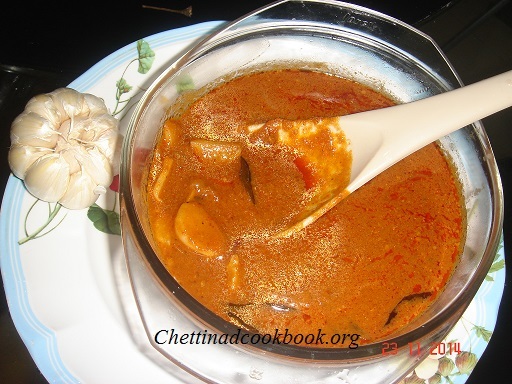 Kuzhambu is in different genre as Kara Kuzhambu ,Puli kuzhambu,Vatha Kuzhambu,getti Kuzhambu and so on…This is famous in chettinad cuisine we have loads of getti kuzhambu and that is commonly liked by all,served in functions and marriages.I use to make getti kuzhambu with most of the vegetables because it is our family favourite,added advantage is this Kuzhambu matches with Idly dosa,apaam and rice and also it stays for two days with out any change in its taste. 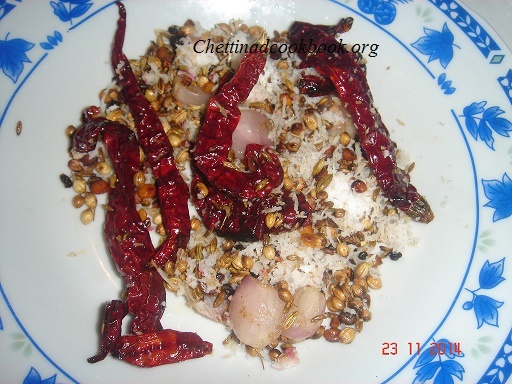 To make in large quantities and to add more delicious taste try this Araichu vitta getti kuzhambu this method can be followed in all type of getti kuzhambu. Heat pan with one teaspoon of oil roast all “To grind”ingredients,till golden brown. Grind this fried ingredients to smooth paste. Peel garlic and Onion cut in lengthwise. Heat pan with two tbsp of oil season with the above mention “For seasoning” ingredients. Add curry leaves, Tomato, Turmeric powder, and Salt along with it saute well until Tomato leaves its skin. Add 1 1/2 cup of water, ground paste and Tamarind extract let it boil in low flame for at least 10 minutes, oil floats on top of the Kuzhambu.